My brother, Rob, is a fan of music; all music, really, but he seems to really enjoy what I know as Indie Rock, and what I personally think of as alternative rock that is not popular enough to be on top forty radio but has a strong, loyal following, tours small, local venues, and puts out good but lesser known or unknown music outside the Indie Rock loyalists. I also sometimes think of it as a type of musical philosophy or approach, i.e. if any of the Indie Rock bands become popular enough to make it big, be played on top forty stations, and get big record and tour deals, a true Indie Rock fan would be obligated to disown them and label them sell-outs. Anyway, Rob has been a fan of Indie Rock for years and spends a lot of time going to small venues that feature this type of band and lots of talented local bands. He has talked me into going to see two of them. One was in Toledo in 1998; we saw the World Inferno Friendship Society. Good times. The second time was last night. I went to the Grog Shop in Cleveland Heights, Ohio, and saw Lou Barlow and the Missingmen. 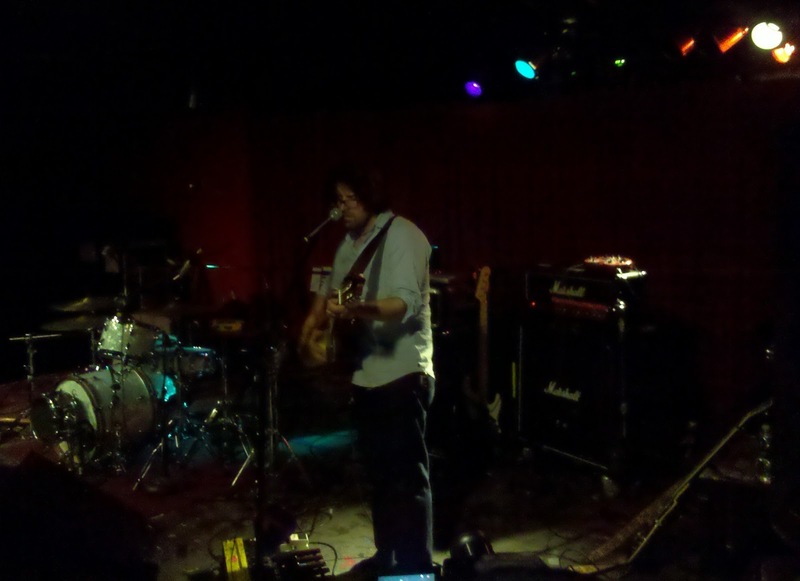 My brother had suggested several times in the past that I see Lou Barlow. He told me about Lou's successful career as a solo artist and as a member of the band Dinosaur Jr. The Grog Shop is in a popular and trendy Cleveland area hot-spot called Coventry. It reminds me on a much smaller scale of Ann Arbor. It is near Case Western Reserve University, and therefore attracts a lot of college students. The Grog Shop is a small venue that consists of an open room with a bar on one end and a small stage on the other. When I got there, one of the opening bands was playing. Lou was out getting ready, walking among the crowd, and talking with friends and fans. He took the stage and did a set of solo acoustic songs, was joined by the band for another set, and finished up with another solo acoustic set. He performed for about two hours, and interacted a lot with his fans. I don't know enough about music to write a critical post about any band. I could count the number of live music concerts I've attended on my hands. I will say that I enjoyed the show enough to buy one of Lou's CDs and a t-shirt, stayed for the entire event, and even hung out a while afterwards. Lou is a very talented musician and I hope he has a happy, successful career for as long as he wants it. Although I can't write a critical post about Lou's music, I can write about what stood out to me about the event. First, and somewhat trivially, I noticed Lou wasn't wearing socks during the show. I was so struck by that that I was going to ask him about it after the show. I was imagining all sorts of interesting reasons for not wearing shoes during a performance, like being able to better feel the vibrations of the music, or maybe something superstitious. 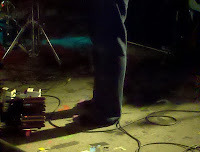 That mystery was solved about two-thirds of the way through the show, when Lou announced it was merely because, with shoes on, his feet are too wide to comfortably operate the pedals on his equipment. The second thing that stood out was the crowd itself. It was not as crowded as I thought and hoped it would be; there were maybe about seventy-five to one hundred people there. But the crowd was intensely engaged with the music, and seemed very familiar with Lou and his work. One girl seemed so moved that by the end of the show she had cried a little. While Lou and the Missingmen were playing, very few people left the stage area, not even to refill their drinks, even though they could have heard the music just as well at the bar that was only fifty feet away. I can't say what Lou's career goals are, and I don't know why anyone likes the music they like. But I can say that the people that came out to see Lou Barlow play last night are fans in the truest sense, the real deal, and for the true love of Lou's work. Although I've enjoyed both bands I've seen at small local venues, I don't know that it will become a regular thing for me, but when Lou Barlow comes back to Cleveland, I'll be there. I wish Lou all the best for the rest of his tour, his music, and his life.